This fascinating cultural tour combines guided visits to the most important sites of Cusco: The Qoricancha, the colonial-era Cathedral, with its wealth of artworks, and the imposing Inca ruins of the Sacsayhuaman Archaeological Park. We pick you up from your hotel and start to visit the historical center, Plaza de Armas (Main Square) In Inca times; it was called “Huacaypata,” a Quechua word meaning a place of meeting or of weeping. It was an important ceremonial site, where the Festival of the Sun was celebrated each year. It was also the site where Francisco Pizarro proclaimed the conquest of Cuzco. With the arrival of the Spanish, the plaza was transformed: they built stone arches and erected the buildings that still surround it nowday. 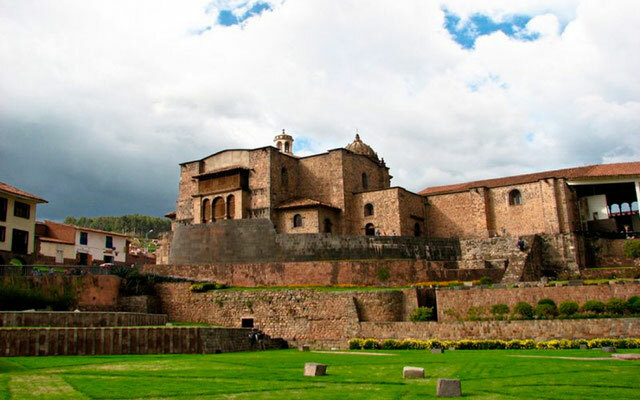 Construction occurred in two phases: first the Chapel of Triumph was built on what had been the ancient temple of Suntur Wasi (House of God); afterwards, the cathedral was erected on the palace of the Inca Wiracocha. The Renaissance style dominates the façade and the interior, which features particularly exquisite carvings in cedar and alder. The choir and the pulpit are both remarkable for their beauty. It houses an important collection of paintings from the Cuzco School and silver-embossed objects. The complex comprises 33 archaeological sites, the best known of which is the Sacsayhuaman Fortress. The building was probably used for religious purposes but, due to its location and style, the Spanish and contemporary writers assumed it was a military structure. The consensus among historians suggests that the construction of Saqsayhuaman began at the end of the 14th century and the beginning of the 15th century, under the leadership of Inca Pachacuteq. In terms of how long the construction took, contemporary references indicate it took around 60 years. Saqsayhuaman would have held the most important temple in Hanan Qosqo or Upper Cuzco, dedicated to Andean cosmology, worship of the Inti (Sun), Quilla (Moon), Chaska (Stars), Illapa (Lightning) and the other divinities. The building qualifies as a cyclopean construction due to the size of its stones, some of which weigh between 90 and 128 tonnes. On 24 June each year, the archaeological site is the setting for the Inti Raymi or Festival of the Sun. Qenko or “labyrinth” is considered a sacred place in which ceremonies were performed in honour of the Sun, the Moon and the stars. The complex holds numerous halls, inner plazas, aqueducts, watchtowers and paths. Its role would have been a “tambo” or a place of rest and lodging. According to legend, each time the Inca visited Tambomachay, he was accompanied by a large retinue that stayed in Puka Pukara. Its fortified appearance led to it being called a fortress. The building would probably have had an important religious role linked to water and the regeneration of the earth. The site stretches over approximately half a hectare, and the material used for its construction was polygon-shaped limestone. Finally return to Cusco and your hotel. It is located on a north hill of Main Square of the city and is linked to the historical center through the oíd inka neighborhoods of Qolqanpata (San Cristóbal) and Toqokachi (San Blas). ln both districts there are two pedestrian walkways and vehicular access routes that lead to Saqsaywaman Archaeological Park, one starts at the Street Saphy -Llaullipata and the other in Circunvalación avenue.